It sets virtual pending orders, stop loss and take profit. It can set real stop loss and take profit if desired. It makes trading independent of bid-ask line concept, thus useful for very short term traders and price action traders. Orders can be opened, managed and closed with 1 click providing fastest management. It can automatically set your position sizing based on your risk inputs. 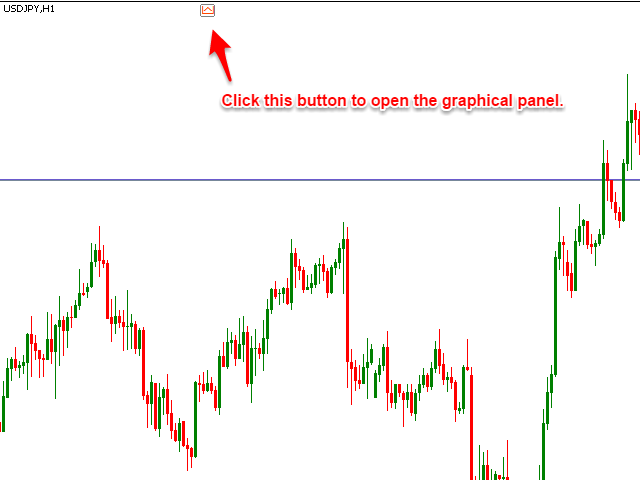 Graphical panel enables inserting new inputs in few seconds. What it does not do? It does not set real pending orders, thus order is executed through your computer (EA). It cannot be used for backtest in strategy tester. It does not automatically move the lines/levels. 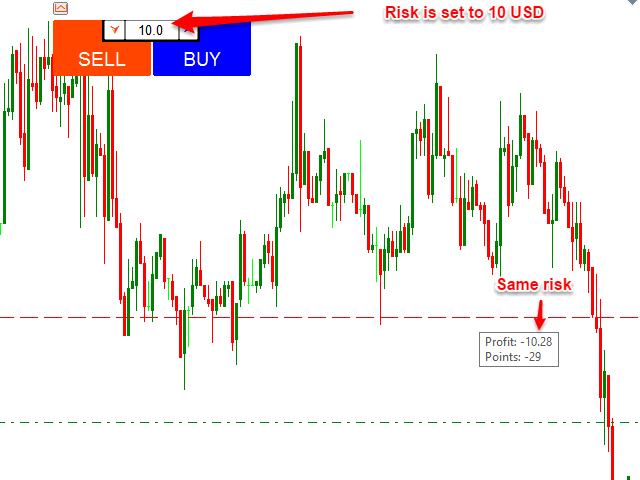 RiskType: Can be either in fixed lots or you can have a fixed money risk. Can also be a in terms of percentage of account balance for risk controllers. Risk: If risk type is set to fixed lots then enter lot number, if it is fixed money then type the risk in money while percentage risk needs to be written the percentage number. 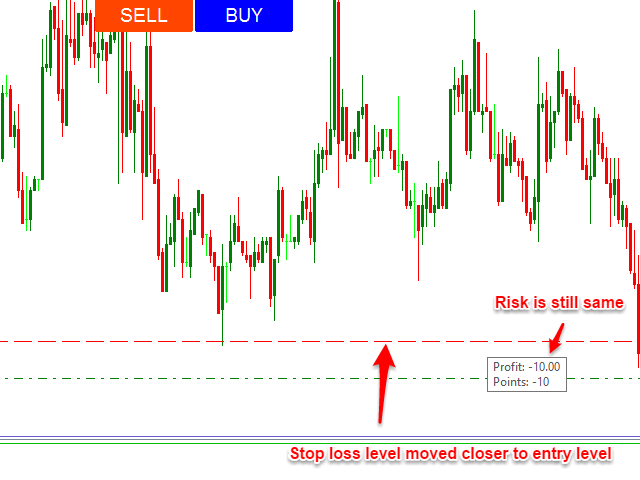 StopLoss: Initial stop loss when virtual order is placed on chart. 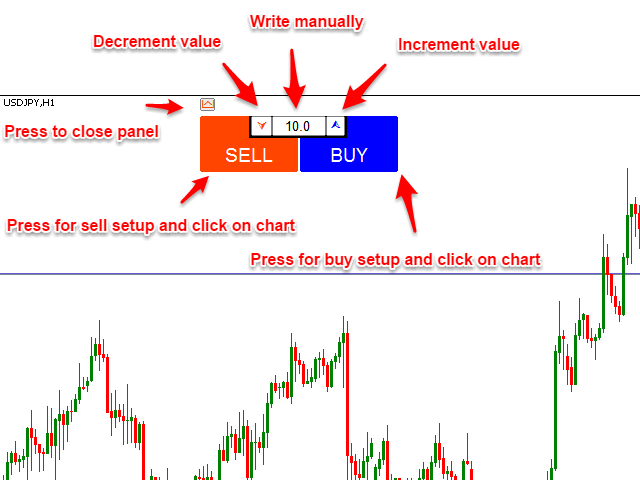 TakeProfit: Initial take profit when virtual order is placed on chart. 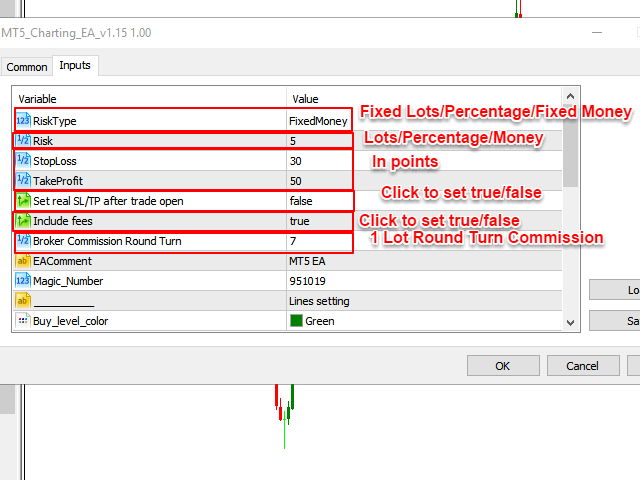 Set real SL/TP after trade open: If true then after trade is opened, EA will automatically set real stop loss and take profit. This is a useful feature if you need to record your analytics through 3rd party software or if need to close the platform. Include fees: If set true then spread and commission is calculated and position size is reduced such that when trade is closed you will lose the absolute value you risked. Broker commission Round Turn: Each broker has different Round Turn commission, ask broker for these details. Set Zero if there is no commission. You can also change line colors, width and style but initial ones are set to match real orders characteristics. There is a small button at middle top of the chart, you need to press it so that graphical panel can open, press it again and it will close. If you press on buy and click on chart, EA will place your order at that location. Same goes for sell order. EA uses market orders to open orders i.e when price will cross the order level by 1 point then the order shall be executed, same goes for stop loss and take profit. Also, EA does not care about bid-ask line. When EA closes the order on stop loss or take profit, it will only care about what the actual price of market is, bid price is ignored and only ask line is considered. Fee structure can be calculated if set true, spread and commissions will however reduce the position size so that you only lose the absolute value you risked. If your account has commissions then ask your broker for round turn commission for 1 Lot and enter that value in the input. 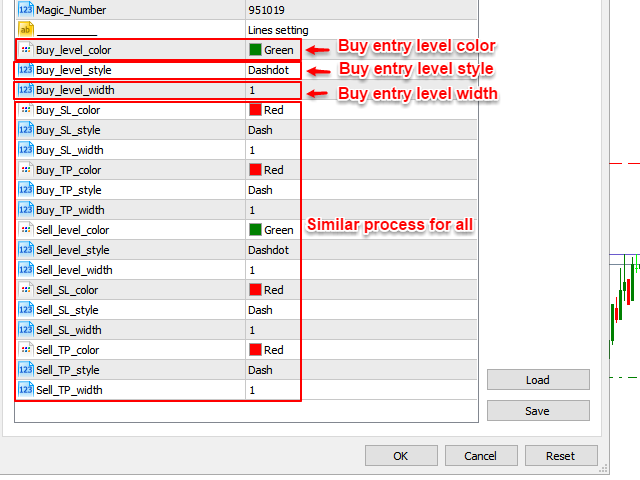 EA can also set real take profit and stop loss after order is opened so that if you shut down the platform or need to record your statistics through a 3rd party software, it can be done. Option can be disabled if not need. 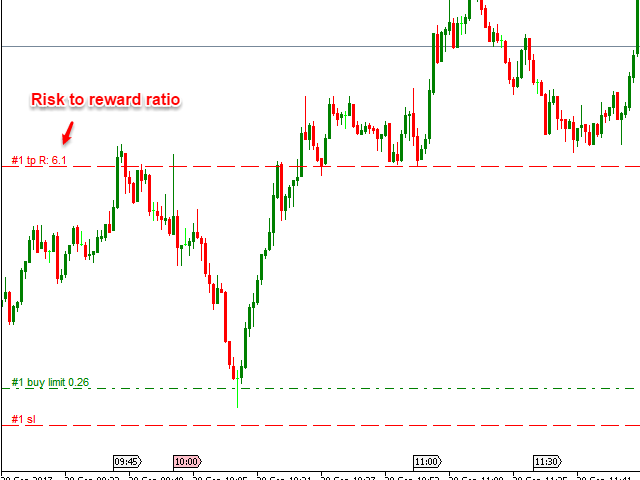 Take profit also shows what is your risk:reward ratio so that you can keep track of risk management. An important passive function is that you can double click the line and fix your levels. 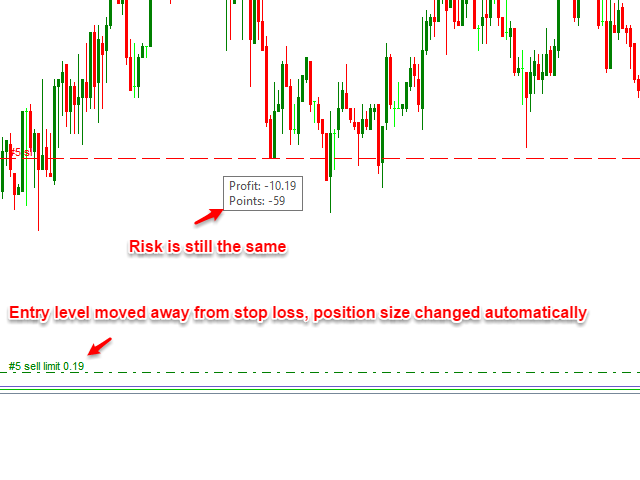 If you fix your stop loss at a certain price level and your risk is set to a certain amount or percentage, then no matter where you place your entry order, your risk will remain the same as EA will automatically size your position. Please note: When order is opened, do not take stop loss line above/below price level. If you place a sell order and it is opened by EA, then do not take stop loss below price, otherwise EA will close that order regardless of whether it hit the level or not. Same goes for take profit, do not take it above (in case of sell order) or below (in case of buy order), otherwise EA will close that order. Feedback and suggestions are welcomed, EA will keep updating in the future so stay tuned!